And thy own soul a sword shall pierce, that, out of many hearts thoughts may be revealed. This feast commemorates the rescue of the true Cross of Christ by Emperor Heraclius in a victory over the Persians. 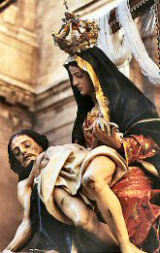 Our Mother the Church sings of the triumph of the Holy Cross, the instrument of our salvation. In France, paper-thin sweet wafers called gaufres were baked by street vendors. Serve waffles on St. Michael's Day to continue this tradition. The Feast of the Exaltation of the Cross is an appropriate feastday to thank God for the blessing of Christ dying on the Cross, which opened the gates of heaven for mankind. Here is a family project which involves making a homemade cross. The Monogram of the Blessed Virgin. The letters of the name "Maria" are evident in this ancient symbol. A crown was sometimes placed over the monogram by Medieval artists. The moneybags refer to the occupation of St. Matthew before he was called to follow Christ. He was a tax gatherer known as Levi. The great work of the Archbishop of Constantinople to overcome crime, heresy, and corruption was interrupted by avaricious enemies who effected his exile, which lasted four years, and ended with his death. One of the Four Western Fathers, along with Sts. Augustine of Hippo, Ambrose of Milan and Gregory the Great. He contributed courage and wisdom in his defense of the truth. His translation of the Bible into Latin, known as the Vulgate, is in general, the version authorized in the Roman Catholic Church. 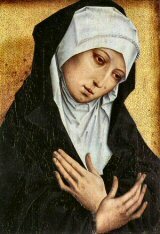 Happy the heart of the blessed Virgin Mary, which without dying earned the palm of martyrdom beneath the Cross of our Lord. 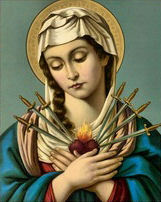 The month of September is dedicated to Our Lady of Sorrows, whose memorial the Church celebrates on September 15. September falls during the liturgical season known as Ordinary Time, which is represented by the liturgical color green. 12. 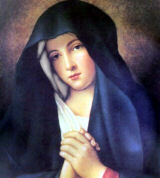 Most Holy Name of Mary, Opt. Mem. 17. Robert Bellarmine, Opt. Mem. 26. Cosmas and Damian, Opt. Mem. 28. Wenceslaus; Lawrence Ruiz and Companions; St. Simón de Rojas O.SS. (Spain), Opt. Mem. The Gospels for the Sundays in September 2018 are taken from St. Mark and are from Year B, Cycle 2. This Gospel relates the cure of a deaf man by Jesus. Peter says "You are the Christ". Jesus talks about His coming passion. In this Gospel Jesus says whoever receives one child in His name receives Him. Jesus talks about scandal in this Gospel. This month the main liturgical feasts are St. Gregory the Great (September 3), the Birth of Mary (September 8), Holy Name of Mary (September 12), St. John Chrysostom ( September 13), Exaltation of the Holy Cross (September 14), Our Lady of Sorrows (September 15), St. Robert Bellarmine (September 17), St. Januarius (September 19), St. Andrew Kim and Companions (September 20), St. Matthew (September 21),Sts. Cosmas and Damian (September 26), St. Vincent de Paul (September 27), and Sts. Michael, Gabriel and Raphael (September 29). The feasts of St. Peter Claver (September 9), Sts. Cornelius and Cyprian (September 16), St. Pio (September 23) and St. Jerome (September 30) are superseded by the Sunday liturgy. 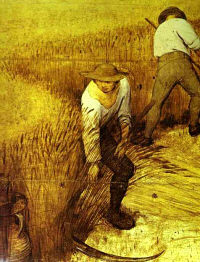 The September Ember Days were particularly focused on the end of the harvest season and thanksgiving to God for the season. Ember Days were three days (Wednesday, Friday and Saturday) set aside by the Church for prayer, fasting and almsgiving at the beginning of each of the four seasons of the year. The ember days fell after December 13, the feast of St. Lucy (winter), after the First Sunday of Lent (spring), after Pentecost Sunday (summer), and after September 14, the feast of the Exaltation of the Holy Cross (fall). These weeks were known as the quattor tempora, the "four seasons." Since the reorganization of the Roman calendar in 1969 after the Second Vatican Council, Ember Days are still retained in principle, but how and when they are to be observed is at the discretion of each country's Episcopal Conference. There is no longer set Mass readings for the Ember Days in the Ordinary Rite. Another harvest feast is September 29, the Feast of the Archangels Michael, Gabriel and Raphael. Before the revision of the calendar, this used to be only the feast of St. Michael. In many countries this day was referred to as "Michaelmas" and is celebrated with traditional foods and customs. By Jennifer Gregory Miller, 2003. Explanation of Ember Days—Three days set apart for fasting, abstinence, and prayer during each of the four seasons of the year. They were the Wednesday, Friday and Saturday after St. Lucy (or Lucia, d. 304) (December 13), the First Sunday of Lent, Pentecost, and the feast of the Holy Cross (September 14). Since the revision of the Roman calendar in 1969, Ember Days are to be observed at the discretion of the National Conference of Bishops. Moreover, their observance may be extended beyond three days and even repeated during the year. Possibly occasioned by the agricultural feasts of ancient Rome, they came to be observed by Christians for the sanctification of the different seasons of the year, and for obtaining God's blessing on the clergy to be ordained during the Embertides. (Etym. Anglo-Saxon oemerge, ashes.) — Modern Catholic Dictionary by John A. Hardon, SJ, Doubleday, 1980.